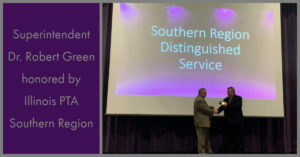 Collinsville Community Unit School District #10 Superintendent Dr. Robert Green was honored by Illinois PTA Southern Region during their annual dinner and meeting held on Friday, March 22, 2019 at Collinsville High School. The Illinois PTA Southern Region represents 36 counties in a territory that stretches from Jerseyville, IL in the north to include the entire southern part of the state. Dr. Green was honored for eight years of service as a superintendent in the Southern Region. He will be retiring from CUSD 10 in July 2019. Southern Region PTA President Mr. Greg Hobbs presented the award to Dr. Green. In addition to the office he holds with Illinois PTA, Hobbs is a teacher at Kreitner Elementary in the Collinsville School District. He also thanked Dr. Green for allowing Collinsville High School to serve as the venue for this year’s dinner. Retiring Belleville School District 118 Superintendent Matt Klosterman was also recognized and several PTAs from the region were honored for outstanding accomplishments. The evening featured a celebration of the region’s Reflections art students. Forty students were recognized for participation, 15 were awarded STATE level status and two are advancing to the National PTA’s Reflections program. Categories included film, literature, photography and visual arts.